Experience the adventure of camp, connect with both friends and nature, and grow in mind, body, and spirit. 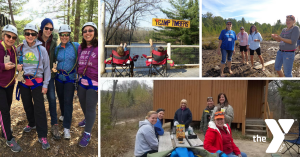 Rates for the weekend include meals, lodging, and camp programming. Sign up by yourself, or sign up and request a cabin with all of your friends. Lodging for the weekend is provided in our rustic cabins. All cabins have fourteen built-in bunk beds, with heat and electricity. Bathrooms and showers are located nearby at our bathhouses. Participants should plan on bringing their own linens (we recommend a twin fitted sheet, a pillow, and a sleeping bag). A variety of camp activities are offered within the weekend schedule, allowing you to choose to do as much or as little as you like. Activity options include: 40ft giant swing, canoeing/kayaking, climbing tower, high ropes course, team-building course, nature hikes, zip line, disc golf, evening campfire with “gourmet” s’mores, group fitness classes, and more. Interested in hosting an activity this year? Our continued goal for 2019 is to place a greater emphasis on wellness during the weekend, including offering a variety of fitness classes and other activities to complement our existing program. If you have a particular passion, skill, or experience, please contact me if you’re interested in sharing with other participants. This may include leading a fitness class, teaching a craft, sharing a favorite game, etc… Collectively, you have a wealth of knowledge and skills that would be wonderful to share. We hope you’ll enjoy this weekend as a time to have memorable camp experiences, to connect with both friends and nature, and to grow in mind, body, and spirit. Please note, YMCA Camp Timbers is a drug/alcohol-free facility.